BLACK JACK DPM is a ready to use, odourless, rubber enriched bitumen emulsion which provides a highly effective sandwich damp-proof membrane for floors. Also acts as a waterproofer for walls, above ground structures and foundations. May be used internally or externally. BLACK JACK DPM is also suitable for use as an adhesive for wood block, mosaic panels, insulation boards, expanded polystyrene, cork and as a plaster bonding agent, even on difficult surfaces. Forms an impervious water and water vapour barrier on most surfaces. Low hazard - Water clean up. STIR WELL BEFORE USE. The product is brown in colour but dries black. Before applying, ensure all surfaces are clean, touch dry (free from excess water), sound and free from any contaminants, which may affect adhesion. Base concrete must be finished off with a wooden float to give a smooth surface. Tamped surfaces are not suitable owing to the difficulty of ensuring adequate coating over the high spots. Prime porous surfaces with BLACK JACK DPM diluted 1:6 with water and allow to dry. All phases of the installation should comply with BS Code of Practice 102: 1973 - protection of Buildings from the Ground/Section 3. Apply by brush, a minimum of 2 coats, each at 0.8litre per m2, carrying the treatment up the walls to join the existing wall DPC. Allow the first coat to dry before applying the second coat at right angles to the first. When dry, a sand/cement or concrete screed of approximately 50mm thick is then laid over the BLACK JACK DPM membrane. Level uneven surfaces with cement mortar. Apply three coats of BLACK JACK DPM with a soft bristled brush, each at a rate of 0.5ltr/m2., allowing each coat to dry before applying the next. Allow the final coat to become tacky, then blind with clean, sharp sand. Remove wallpaper, loose emulsion/gloss paint and any dust or grease. Make good any damaged or perished plaster. Lightly dampen the prepared surface and apply 3 coats of BLACK JACK DPM with a soft bristled brush, each at a rate of 0.5ltr/m2., allowing each coat to dry before applying the next. A horizontal strip running 300mm deep should be left uncoated at the top running the whole length of the wall. This permits trapped moisture to escape by evaporation. Wherever possible, very damp walls should receive an external treatment such as waterproof render/masonry paint etc. If it is not possible, the following procedure may benefit although it must be emphasised that only adequate external treatment will cure the most severe conditions. Hack away old plaster from the entire area and damage to joints or brickwork must be made good with cement mortar. When the mortar has dried, apply 3 coats of BLACK JACK DPM with a soft bristled brush, each at a rate of 0.5ltr/m2., allowing each coat to dry before applying the next. When the final coat has thoroughly dried, the wall should be re-plastered. Gloss paints and other oil or alkyd based paints must not be used over a surface treated with BLACK JACK DPM. Where BLACK JACK DPM has been used over plaster, it is recommended that a lining paper, fixed with cellulose paste should be hung. This will provide a suitable surface for emulsion paints and for wallpapering. NOTE: Vinyl coated papers or paper backed vinyls should NOT be hung over BLACK JACK DPM. BLACK JACK DPM will provide a waterproof membrane on bridge abutments, retaining walls, culverts, concrete or brick foundations. It also acts as a curing membrane when applied to green concrete. The surface should be sound and free from dust, dirt and grease. Hot, very dry or absorbent surfaces should be dampened with water. Apply two coats of BLACK JACK DPM each at a rate of 0.5litre/m2. For fixing wood blocks of 12mm thickness and above, dip the bottom face of each block into the material and place into position immediately. Coverage is approximately 1.1litres/m2. 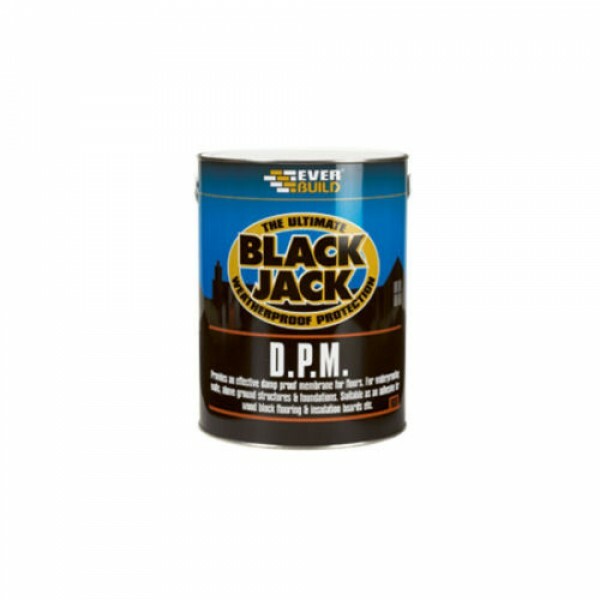 For fixing wood mosaic panels, spread BLACK JACK DPM onto the surface at 0.8litres/m2. and place the panels into position immediately. A minimum of 24 hours should be allowed before sanding/trafficking. Where under floor heating is incorporated into the sub floor, the heating must be turned off for at least 48 hours before and after tiling. NOTE: On low porosity or non-porous surfaces, allow the BLACK JACK DPM film to partially dry before placing the wood mosaics/blocks into position. In most circumstances, a period of 30-40mins will suffice, but do not allow to dry off completely. Under no circumstances, should such floorings be laid on existing floor coverings. NOTE if gloss or alkyd paints are to be used as a decorative finish, the plaster over the BLACK JACK DPM must be applied in two coats to give a minimum total thickness of 15mm. FIXING INSULATION BOARD, EXPANDED POLYSTYRENE AND CORK SLABS. Clean tools immediately after use with water. Once cured, dried product can be removed with Kerosene (paraffin) or white spirit. Resistant to: most salt solutions, dilute acids and alkalis, water. Not resistant to: Oils, solvents and some detergent solutions. Store in original container in cool, dry conditions. PROTECT FROM FROST. 24 months from date of manufacture when stored according to manufacturers instructions.